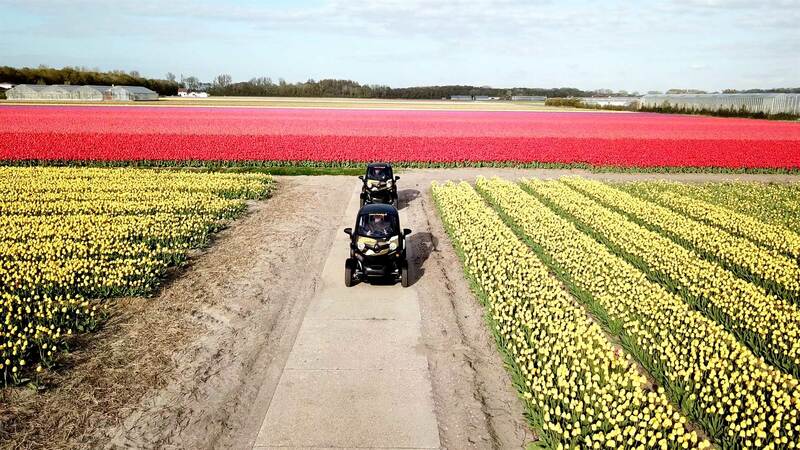 Discover the Flower Fields around the Keukenhof in an exciting and efficient way with the Twizy-Electronic Vehicle! Experience the enchanting and iconic tulip fields at their purest! Enjoy a trip through the famous Flower Bulb region with the Tulip Tour. Take in the colours and the smells, and stop as often as you want for a selfie among the tulip and flower fields. In an electric 2-person Renault Twizy, with GPS navigation and audio guide, you can explore one of the most beautiful and colourful regions of the Netherlands at your own pace. You drive, in the tough, open-cab Twizy, a twenty-kilometre rout among the colourful tulip and flower fields, through the Keukenhof forest, and to an authentic flower bulb nursery. The audio guide tour tells you all the ins and outs about the area and shares cool tulip facts. You will not follow tour bus routes, but goes off the beaten track. Cruise on country roads through the flowering tulips and park your Twizy beside the road to admire the sea of flowers up close. Driving a Renault Twizy is super easy and fun: on the road you attract a lot of attention! The Twizy is 100% electric and super silent, so your tour is environmentally friendly and gentle on your ears. You can book the Tulip Field Tour, including GPS navigation and audio guide, from mid-March to mid-May. From the end of March to mid-May the tulip fields are in gorgeous bloom. Discover the Flower Bulb region and the traditional Dutch landscape in an original and unforgettable way. Select the date and your departure time. After your reservation you will receive a ticket with all the information you need to know! Located at 850 meters from the Keukenhof entrance and is easily accessible by car, public transport, taxi or Uber. In order to experience a full day of tulip & flower magic, you can also book this 100% electric GPS tour in combination with your skip the line tickets for Keukenhof including Public Transportation online. Meer en Duin 36a Lisse. You can find more information on your ticket.